With the possible exception of the North Vietnamese. Jim Reeves and co. have filed for approval of the final settlement with Singing River Health System. They also have an extensive filing in support of their $6.5 million fee. The full deposition of Mike Crews in the Singing River Health System Pension litigation. 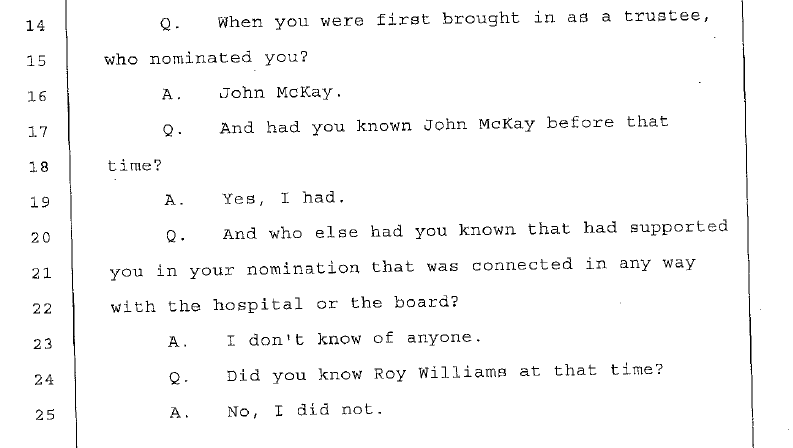 By popular request, the deposition of Morris Strickland. If you are contemplating objecting to the proposed settlement, you must know that you will not be alone. You should not fear repercussions from your employer – for that is prohibited by labor law. You should not fear repercussions from your co-workers – many of them are also filing objections. You must do what is best for you and your family. Will your boss or co-worker help you buy groceries in old age? Can you depend on them pick up the slack that Singing River and Jackson County have let out? You should not fear repercussions from your attorneys – you are their client. They have an obligation to honor your wishes. We can tell you that attorneys who put their name on the settlement agreement will be filing several objections on behalf of their clients. Some of those clients have been very outspoken throughout this process. Know that if you choose to object, you’ll never walk alone. You have until the deadline to file your objection with the US District Court to the proposed settlement with Singing River Health System. Imagine an election where your ballot is already cast for a candidate. The name of the candidate will not be revealed until after the election is over, but your vote will count even if you don’t show up to the polls. Your vote will still count even if you never registered to vote. You would never vote for someone without even knowing his name, much less his character. This is the situation with the Singing River pension settlement. Even though the numbers are available to the attorneys, accountants, and other experts, not one person has told you what kind of reduction your pension benefits will take. Remember those old TV commercials “Put it in writing AT&T!”? If you demanded your long distance service to put the details in writing, why should you accept less from your pension plan, employer, and attorneys? Will it be an 88% benefit or a 75% benefit? Will anyone put it in writing? Even though you never signed up with an attorney, and even though you haven’t made a decision, the courts will cast your ballot in favor of a plan, unless you take action to stop it. The truth about this situation is you will take a side whether you like it or not. You will either stand with truth, justice, and honor, or you will stand with slick attorneys and allow Singing River to never tell the truth about what really happened. I believe a settlement is badly needed. Retirees/employees will get less than they deserve. That is true of all settlements. But if benefits are to be cut in the future, or greater risk placed upon retirees for market changes, then those actions and approval of a settlement have to be done in the most open manner possible. We are adults. We know life is not fair. We have all been disappointed by employers, friends, family, governments, etc. But if I am going to be screwed, I want to at least know why, how and when. So do the SRHS retirees/employees. This struggle began over a lack of transparency in the operations and management of Singing River Health System. Despite all the litigation and media coverage, a select few are still bent on deciding the financial fate of thousands in back room, secret meetings. Let us pray they fail. SRHS asked US District Judge Louis Guirola to stop over 150 new cases filed in Jackson County Circuit Court. He has denied their request, though has left the door open for them to come back and ask again. This will hopefully advance the cause of justice under the stewardship of Judge James Bell. Judge Bell was recently appointed by the Supreme Court to oversee the circuit court cases in addition to the Denham & Barton cases in chancery court. SRHS Watch is thankful to its contributors who routinely provide us with timely updates. Here’s an excerpt from former SRHS trustee Morris Strickland on how he came to be appointed to the Board of Trustees. Those of you who have additional information on this story should be interested in what he had to say. Singing River’s recent filing in federal court admits several times that it is highly likely that SRHS will not be able to make settlement payments as described. The motion was intended to stop new litigation filed by attorneys Earl Denham and Harvey Barton on behalf of SRHS retirees. In making the argument, Singing River makes admissions that the likelihood of default on settlement payments is much greater than what they are telling the public.